"You spin me right round, like a floppy baby right round"
Here are the custom case I made from a cardboard box for my Ralf David XL/XE eprom burner and customized Atari cartridge, some paint touch up and print/label/badge work still need to be done on it. Bottom center is my Syscheck 2 board with a custom case (which only covers about 2/3 of the board) I have made out of an old cassette case. A bit of body work and further painting and name badge to be added still on it. I've just got it hot-glued to the inside of the front halve of the cassette case, which holds it securely, but I can easily remove it if need be later on (like to use with an XE machine). the case still opens and closes for easy access to the GAL chip sockets and a window for access to the dip switches was cut. Eventually the case will be painted completely XL white. 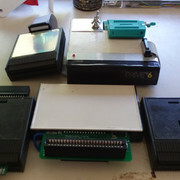 On the bottom right is my The!Cart, transplanted into an Atari cartridge case. I did this after trying to "clean up" the 3D printed case it came with and basically destroying it with my Dremel tool. 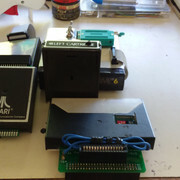 So I took another of my extra Atari games, and use the cartridge case, just like the cart expansion board and the eprom burner's cartridge board. Again, not finished until I get it a label. 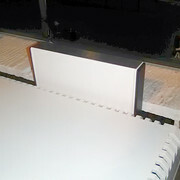 For all the cartridge cases, they will eventually get printed labels in the later silver label style Atari cartridges. I also have an old Sega Star Trek SOS game cartridge that had a worn label and it will get a new label and paint job too. I've custom painted some prototype XE style gray cartridge cases too, the ones that have XL style edging, not the later smooth style with the ridge across the back. And since they looked like they are made to go with the XL line, except for the gray color, I've painted them XL white to match. I'll show those in later pictures with all my other custom painted controllers and devices. Some of these you may have already noticed in other pictures I took, inadvertently pictured in the background. 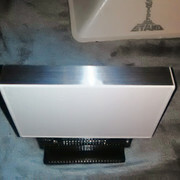 Here is my Syscheck case, now finished painting and adding brushed metal trim. All that is left is some print/lettering/designation on the brushed metal strip. I have yet to find something to use for that. This is true of a couple other items from above (R.D. 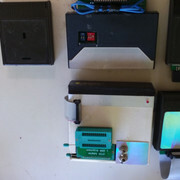 XL/XE eprom burner) and below (track-ball controller) too. I've been trying to locate some black-on-clear letter and number decals that are similar to the Atari XL line print font and size used on XL brushed metal trim. But no luck in searches yet. For those who might have missed some of my other XL livery custom painted items and restored/refurbished items I've shown over the previous couple of years, buried deep in the "What's New Pussycat" thread in the 'You and Computers' forum. Since I doubt most people are looking back through about 65-70 pages of posts there. 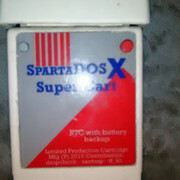 Dropcheck Super SpartaDOS X w/RTC cartridge I fixed with a proper cartridge guide and painted XL white. ST mouse in XL colours. custom XL/XE cartridges made from prototypes in XL white. 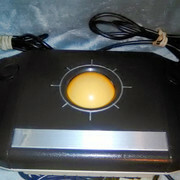 Refurbished and restored CX22 Track-Ball controller, still needs lettering redone on brushed metal strip. 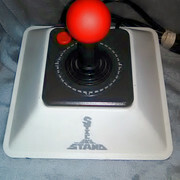 Wico Command Control joystick painted in XL colours. Atari CX20 rotary Indy 500 controller and CX30 Paddle controllers in XL colours. I still have to get some labels on some custom cartridges I showed in the first post above, and one or two others then I'll show them finished as well. I like the XL mouse. Got four or five ST mice here... might follow suit with one of them. Thanks. The STM1, even though it's not the best ergonomically designed or even mechanically, but it's wedge shape goes great obviously with ST and XE lines but also the XL line...it just needed matching colours. I don't know if you noticed, I probably should have taken a shot from another angle, but it is two-tone, with XL white on the bottom half, and it just looks really good next to an XL. Of course all XL brown is a way to go too, like the Atari Touch Tablet, but I from my experiments in painting things to match the XL line, I find that going with all XL white still doesn't quite look as good with the over-all system as either all brown or brown and white. I did have a rounded style, and very nice mouse from Best Electronics that they sold years ago, I don't know if they still sell the exact same mouse or not, which I also painted in XL colours. It was more comfortable to use, but when an old friend asked me if I had a spare mouse for his ST, I went with style over ergonomics and sent him the Best mouse. Either way he would have to put up with a XL brown and white mouse instead of ST gray. Proof if proof was needed... THE ATARI 800XL - THIS FORUM's MOST LOVED/OWNED MICRO of the 80s. Some really neat customised paint and label jobs there, Matt. You can clearly see the pride you get from having a smart-looking 'uniform' XL-stylised collection. Once more, congrats on your Atari artefacts - you're a true living lurver of our long-lost labours of lurve! ATARIs 800XL, 800XE, 1200XL, 130XE, 1050s x2 (Happy & USD), Indus GT & XF551 FDDs, 1010, 410, XC11&XC12 tape drives, 1029 printer, ATARIMAX 8mbit flash, SpartaDOS X, the!cart, Syscheck V2.2, SIDE & Uno carts, SIO2PC, Touch Tablet, Koalapad, XG-1 lightgun; BBC MODEL B, Turbo MMC, Acorn ANF03 & Electron; ORIC 1 & ORIC ATMOS, 3" & 3.5" FDDs, MCP40 printer, PASE joystick interface, Speech Synthesiser; Amiga 500+HD & CBM64; Sinclair ZX81, 16K RAM, Fuller keyboard; Sinclair Spectrums 48K & +2. Yeah, I've become pretty obsessive about matching equipment for my XL system...a growing addiction since I first did the ST mouse and then spawned on into joysticks after seeing proto-type 400/800 CX40's in matching beige and with XE's having matching gray from the XEGS...I felt left out with my XL line. And having cartridges that were clearly designed for the XL line, but never being released until the XEGS and then in a XE gray! And on and on from there with custom cases etc. But it has been a deep desire ever since my first days with a 130XE long before the XF551 drive came out, and no XE cassette drives sold in the U.S. market, of always having a mish-mash of XE gray and XL brown/white Atari system and a longing for it all to match like my friend's Apple II and Commodore 64 lines did. I eventually chose the way of the XL line when I was first given a 1200XL about 15 years ago, fell in love with it's keyboard and design. Since the majority of my peripherals where already from the XL line and by then I knew how to upgrade and mod the 1200XL to make it truely 800XL/130XE compatible for the most part. I do intend on getting a CX85 keypad soon, and I intend to paint it in XL colours. Well, I got an new Epson printer a couple of days ago, and picked up some sticker paper to print out labels for my custom cartridges. I made a better label for Xenophobe than the one Video61 gave it. Though I have to redo it, as I made it before I got the sticker paper, with regular paper and covered it with clear tape, but the glue I used to secure the label soaked through the label and bubbled up the tape. I made a custom label for my Star Trek cart, after the old one was damaged badly and I custom painted it too. I never liked the orientation of the original label anyway, as it was upside-down compared to other Atari carts and when sitting in my cartridge case or in an 800XL, the label was upside-down, I oriented it to match other cartridges. I couldn't find any original label images for 8-bit Star Trek cart online, but found a 5200 cart photo I cropped and resized to fit the 8-bit cart. And I don't recall if the Star Trek SOS joystick overlay originally came with the 8-bit version, or 2600 version of the game, but I remember owning it for one or the other back in the day, and I ran across an image of it, so I made my own overlay out of it using the sticker paper that I attached to card stock paper after printing out, and then cut out with scissors. Really a gimmick since there are so few controls for the game and a simple joystick, but it's still neat to have it. A label for The!Cart in it's Atari cart case. I also drilled a couple small holes in the case at the top of the label, so the blue activity LED's can still shine through too. For it's label I used a silver-label version that was made for The!Cart and did a bit of cut and paste to it and decided to name it CARTCART. Lastly, I found the metal trim to my old 1027 printer which was long dead and now lost forever, so I decided to cut out the Atari name and 1027 print part of it and use it for my R.D. 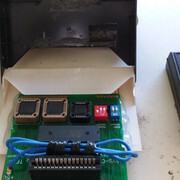 XL/XE eprom burner (Dropcheck re-imaged) case I made, which I think is extremely fitting since the burner only burns and dumps 27xxx series eproms. The only two custom items I still need to finish are my Syscheck case and Atari Track-ball controller which I still need to get name print on their brushed metal trim. Still searching or letter stickers the right size and close font to original brushed metal print...or figure out something else like I did with the eprom burner. No more unused original metal trim around though to at least cut out the ATARI name from...I think I may re-do the eprom burner name plate though, by cutting out a recess in the metal trim so the part I cut from the 1027 trim will fit in and be level with the rest of the trim instead of glued on top. My latest customization is my good old Panasonic 24-pin dot-matrix printer that got me through college with it's near-letter-quality mode and Atari Writer plus. Though it still works perfectly, after years in storage it was looking quite bad and needed a good cleaning and repainting anyway, so why not paint it to match my XL system. I may add an Atari logo or Fuji to it since it's kind of empty looking on the face plate now, but it had to be painted as that area was badly yellowed and I decided to make it XL brown there instead of XL white as it was easier to paint it that way. That "splotching" on the outer gray trim of the control panel buttons isn't paint and I can't see it in real life, the gray trim looks perfect, something the camera is picking up and I didn't notice until I uploaded the pictures...strange...I can see it a little bit now that I'm looking, if I hold it at the right angle, but it looks fine staring directly down at it, but I think I may make that metallic now, like XL brushed metal trim, anyway. 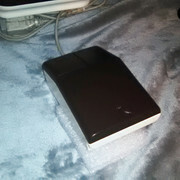 Another repair and customize I did at the same time as the printer (more to come too, but not all are finished yet, I ran out of paint) is this old disk case that had seen better days. The smoked-transparent top not only had become so scuffed up that it looked terrible, but there were several large cracks on the top that had to be repaired ( I re-enforced it on the inside with JB Weld) and the bottom half of the case was yellowed with age. The cracks could still be seen on the top, even after the paint job, so I added the Atari sticker to hide most of it. Now looking good enough to join my system, out in the open.